On Monday 8th October Prep School Assembly was led by the Prefects, who talked to everyone about the progress black lab Bramble is making at the Guide Dog Training School. 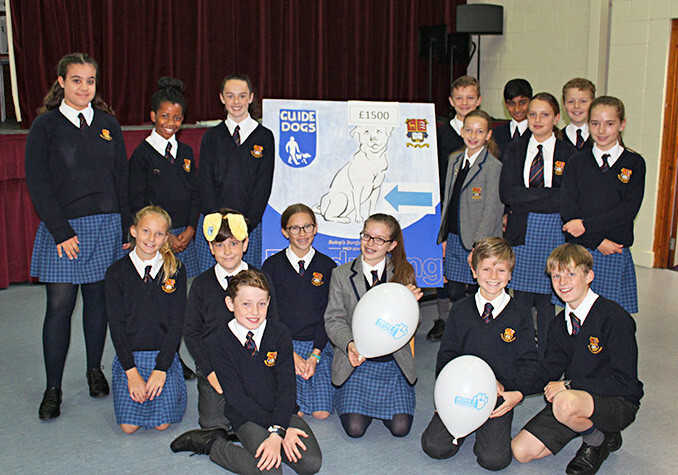 They also launched our new ‘target board’ which is going to be a great way of tracking our progress towards raising £1,500 for Guide Dogs this year. Jake and Ava launched the Prep School's new ‘Name A Puppy’ challenge which this year will include names for two new puppies (one in Shell and one in Forms 1-U3). Pupils in all year groups will be bringing in a small donation to vote for one or two different puppy names, which will be confirmed in November. Bramble is making excellent progress at the training school in Redbridge, and the Prefects talked about how she is learning to wear a new training harness, as well as to walk on a pavement keeping her trainer safely in the middle of the path. We look forward to meeting Bramble and our other new puppies later in the school year. The Prefects did a fabulous job of presenting their first assembly, working well together as a team and planning all their own speeches, PowerPoint slides and ‘questions for the audience’ without any help from teaching staff. They should be very proud of themselves this week. We now look forward to reaching our goal of £1,500 by Christmas!